Mark Flynn is the Dean of Libraries and the ALG Library Coordinator at Columbus State University. 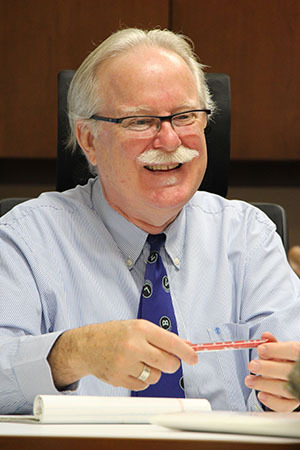 Mr. Flynn is well-known at Columbus State for his advocacy and support of Affordable Learning Georgia’s Textbook Transformation Grants, and has been cited as the reason why Columbus State grant teams have applied. Mr. Flynn focuses on providing advice and support for writing grant applications to prospective teams, and his support has led to seven CSU teams and 17 team members having successful applications. Mr. Flynn is also a Round Two Grantee, where he helped a team of business professors find and evaluate no-cost resources for BUSA 4185, Strategic Management. The BUSA 4185 project will save business students an estimated $32,000 annually. Mr. Flynn also coordinates workshops on open educational resources. Most recently, he hosted three events for Open Access Week, focused on publishing, copyright and open licensing, and open textbooks, the last of which was co-presented by previous ALG Featured Advocate Dr. Susan Hrach.